Though it was once a bank, a stately Art Deco building on the Avenue des Champs-Élysées, in Paris, has been transformed into a sleek, modern shopping mecca designed by Danish architect Bjarke Ingels. The new Galeries Lafayette Champs-Elysées, which opened this past weekend, is a sprawling 70,000-square-foot space made of marble, glass, and steel. In a statement, Ingels called the project a “pragmatic utopia,” mixing minimalist function with extravagant beauty. The rose-hued marble in the interior fits in well with the romantic City of Light and is peppered with gold-lined touches that are spread throughout the space’s four floors. SUPERFLEX: European Union Mayotte, installation view, Contemporary Art Museum St. Louis, September 7–December 30, 2018. Photo: Dusty Kessler. The artist collective SUPERFLEX has produced a brand-new film for the TRANSIT. Addressing the largest border construction in Danish history, Western Rampart is based on the Western Rampart of Copenhagen as a historical construct. The rampart was part of Copenhagen’s inland fortifications, designed to protect the capital of Denmark against invading forces. It was built west of Copenhagen in 1888-92, stretching all the way from Køge Bay in the south to Utterslev Marsh in the north. With its wide-ranging topography, the rampart crosses several present-day borders between the city councils in the region west of Copenhagen, including Copenhagen itself, Brøndby, Rødovre and Hvidovre. The work is exhibited at Køge Station, the terminal of the E line that cuts through this exact area. As SUPERFLEX show in the film, the Western Rampart is not only of interest from a historical perspective. It is also linked to a series of contemporary issues, such as the ongoing attempts to define, delineate and maintain borders. Western Rampart’s focus on the negotiation of borders or boundaries is also present in the work itself with its intersection of fact and fiction and its mix of documentary footage with more visually experimental and associative sequences. SUPERFLEX have used drones to produce the film, exploring – like several other works in the exhibition – mobile methods, i.e. methods used to investigate phenomena in flux that are themselves on the move. The members of SUPERFLEX – Jakob Fenger (b. 1968), Bjørnstjerne Christiansen (b. 1969) and Rasmus Nielsen (b. 1969) ­– were born in Roskilde, Copenhagen and Jelling, Denmark, respectively. They live and work in Copenhagen. TRANSIT is a major research-based exhibition project produced by KØS Museum of Art in Public Spaces. TRANSIT explores transit sites – some of today’s most controversial and crowded public spaces – and the many people who pass through them. Experience art at stations, on the E line, and in an international exhibition at KØS. SUPERFLEX, European Union Mayotte (still), 2016. Two-channel video installation (color, sound), 9:42 minutes, 3:54 minutes. Courtesy the artist. Founded in 1993 by Danish artists Jakob Fenger, Bjørnstjerne Christiansen, and Rasmus Nielsen, the collective SUPERFLEX challenges the role of the artist in contemporary society and explores the nature of globalization and systems of power through a diverse and complex practice. SUPERFLEX describe their works as “tools,” suggesting multiple areas of application and use. At CAM, the SUPERFLEX film installation European Union Mayotte reflects upon migration, the dream of another life, and the front border of the European Union. Mayotte, an island in the Indian Ocean north of Madagascar, is part of the Union of Comoros, one of the four Comoros Islands that were once part of a French Colony. Mayotte has maintained close cultural and political ties to France, and in 2014 was acknowledged as part of the EU, making it the Union’s outermost region. The installation consists of two projections, one pictures a scene of a single boat in the ocean, sometimes with passengers visible, the other follows the production of a small fiberglass fishing boat on Anjouan, an island situated only 70 kilometers from Mayotte. In these small boats, people from Anjouan and the surrounding islands of the Comoros risk dangerous and illegal journeys in the hope of reaching Mayotte—in effect, the EU—journeys that have caused death by drowning for thousands of people. SUPERFLEX: European Union Mayotte is organized for the Contemporary Art Museum St. Louis by Wassan Al-Khudhairi, Chief Curator. Copenhagen's new kunsthalle for 'huge site-specific art installations' opens in refurbished shipyard. Gallery's inaugural exhibitions go to Danish collective Superflex and US artist Doug Aitken. A refurbished shipyard in Copenhagen is opening tomorrow (28 June) as a permanent exhibition hall, filling a gap in the Danish capital’s art scene. “We are very happy to open a space dedicated to huge site-specific art installations at an international level,” says Marie Nipper, Copenhagen Contemporary’s new director, who was appointed in April. She was formerly the interim artistic director of Tate Liverpool. The gallery is on the Refshaleøen peninsula, a former industrial area that also houses the renowned restaurant Noma and is close to the city’s opera house. The inaugural shows at the 7,000 sq. m institution (with 4,500 sq. m of exhibition space) go to the Danish artist collective Superflex and the US artist Doug Aitken. The Superflex exhibition was originally commissioned for the Turbine Hall at Tate Modern in London, where it closed in April. “We will adapt it to our space and plan to have similar co-operations with international institutions in the future,” Nipper says. She anticipates the venue will draw 100,000 visitors and host around six exhibitions a year, of which two or three would run in parallel. Copenhagen Contemporary, which is organised as a foundation, is mainly privately funded. Initiated by the Danish art collector Jens Faurschou, it launched an 18-month pilot programme at a temporary venue in June 2016. At the end of last year, it received around €4.5m from several Danish foundations to support its first three years at the new site. The municipality of Copenhagen has contributed €400,000 for 2018. Faurschou is the vice-chairman of Copenhagen Contemporary’s board. While his international contacts as a former art dealer and one of the most important collectors in northern Europe will be very important for the foundation, it is Nipper who is in charge of programming. SUPERFLEX, One Two Three Swing! Installed at Tate Modern, 2018. SUPERFLEX, One Two Three Swing! With its collective swings, One Two Three Swing! points to the potential and energy inherent in playing and to what people can achieve collectively. Copenhagen Contemporary is proud to present this aesthetic and conceptual total installation in a new format created especially for CC on Refshaleøen. 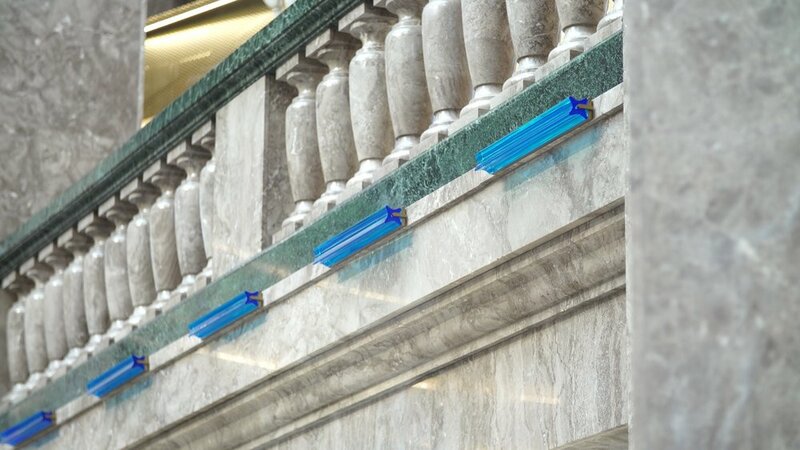 The installation was originally commissioned by Hyundai for TATE Modern. One Two Three Swing! 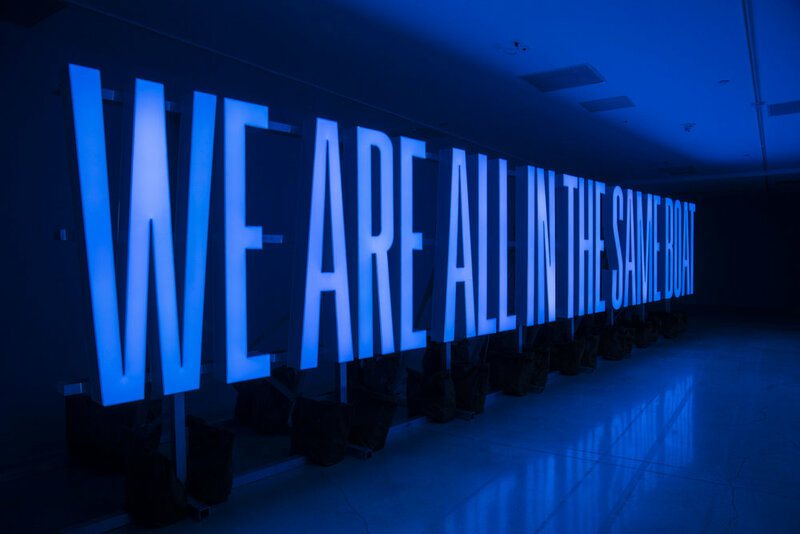 is a large-scale public space installation by SUPERFLEX, which directly confronts the apparent state of apathy of our society with the extraordinary potential of collectivity. The experience of hypnotic apathy is induced by a large pendulum floating over a large and comfortable carpet, which visitors can sink into while letting the world rotate at its own pace. Alternatively, the installation playfully invites visitors to combat the perpetuation of this social apathy and try to swing things around. A collectively-powered orange line twists, turns and stretches through the entire room and beyond while connecting three person swings. The liberating and playful act of swinging becomes possible only through participation and collaboration. A phrase on the base of the swings cautionary advices: “by using this three person swing, the collective power produced will set the orange line in motion and potentially change the trajectory of the planet.” The orange line emerges in each new location of the installation as the suggestion of a new piece of a global mechanism of social participation. Weaving between, within and beyond institutions and public spaces around the world, One Two Three Swing! explores the revolutionary potential of joining together collectively, even through the most innocent and quotidian actions. SUPERFLEX (Danish, founded 1993). 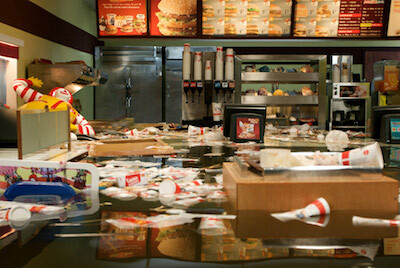 Still from the film Flooded McDonald's, 2009. Filmed on RED; color, stereo sound; 21 min. Courtesy of SUPERFLEX. BROOKLYN, NY.- The Brooklyn Museum announces that Flooded McDonald's by Danish artist collective SUPERFLEX has been added to the special exhibition Infinite Blue and will remain on view through March 4, 2018 in the 1st floor Great Hall. The 21-minute video slowly submerges a life-size replica of a McDonald's restaurant in water, serving an indictment to consumer and corporate influence in the face of climate change. As water levels climb, furniture, food, paper cups, and even mascot Ronald McDonald begin to float, eventually causing the wiring to short-circuit and the space to become fully submerged. SUPERFLEX began Flooded McDonald's in 2008, during the economic crisis and amid growing awareness of climate change. The collective selected McDonald's as a representative of certain multinational companies whose economic power and consumer practices contribute to global warming. Superflex's Hospital Equipment at the Salamieh Hospital, Syria, 2017. Photo Ali Shahin, courtesy Superflex and von Bartha. Victims of the raging civil war in Syria are undergoing surgery assisted by a work of conceptual art. A hospital in the western Syrian city of Salamiyah is playing host to a unique kind of contemporary art exhibition. The three-man Danish art collective Superflex—Jakob Fenger, Rasmus Nielsen, and Bjørnsterne Christiansen—has sent a few pieces of top-notch surgical equipment to the city for the second iteration of a project ongoing since last year. The equipment will now be used to treat victims of the country’s bloody civil war. “We want to challenge collecting itself,” Christiansen told artnet News in 2016. “Do you have to have the object, or can it be just as valuable to you that it be activated somewhere else?” The buyer gets a certificate of authenticity and a photograph of the installation. 1301PE is pleased to announce the opening of SUPERFLEX's exhibition, One Two Three Swing!, for the Tate Modern's 2017 Hyundai Commission. Through an unprecedented partnership with the Tate Modern's community development program, One Two Three Swing! is the first Turbine Hall commission to move beyond the gallery walls. Conceived in states of apathy, production, and movement, the work extends as an orange, human-powered line from the Turbine Hall gallery, into the Tate Modern's south landscape, and around the world. SUPERFLEX engages the productive potential of the building itself, a former power station that once produced electricity for the City of London, through the strategy of 'extreme participation' introduced in 2012 through the urban park project Superkilen. 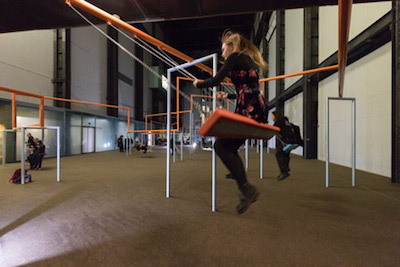 Any visitor to the Turbine Hall is invited to suggest a connection for the orange line, One Two Three Swing! engages the public in experiencing the potential of collective movement by swinging together on the count of three – One Two Three Swing! The film Flooded McDonald's poses questions about consumer culture and the fast food industry. Flooded McDonald's is the second film by the artist collective SUPERFLEX. In the video, a life-size replica of the interior of a McDonald's restaurant slowly floods with water until it is completely submerged and destroyed. Based in Denmark, Sweden, and Brazil, the members of SUPERFLEX consider their works "tools" for investigating systems of power, globalization, and the role of the artist in contemporary society. Flooded McDonald's poses questions about consumer culture and the fast food industry while reveling in the pleasure of destroying a global capitalist icon. If capitalism is slowly on the outs, as some economists and theorists say it is, should there be a museum to preserve its artifacts? The Museum of Capitalism (MOC), an aspiring institution at the very earliest phase of development, opens its first exhibition this month in a disused warehouse in Oakland, California. Its ambitious goal is to educate future generations about the economic system's "ideology, history, and legacy," per its mission statement, in the vein of history museums and so-called museums of conscience. Headed up by the artist duo FICTILIS (Andrea Steves and Timothy Furstnau) and supported by a $215,000 grant from the Emily Hall Tremaine Foundation, its debut exhibition is to be housed in a temporary space in Oakland's post-industrial Jack London Square, an area with multiple vacant warehouses. The artist list, totaling a whopping 83, includes members from around the globe. 1301PE is pleased to announce that Danish collective SUPERFLEX will undertake this year's Hyundai Commission for the Turbine Hall, opening on 3 October 2017. 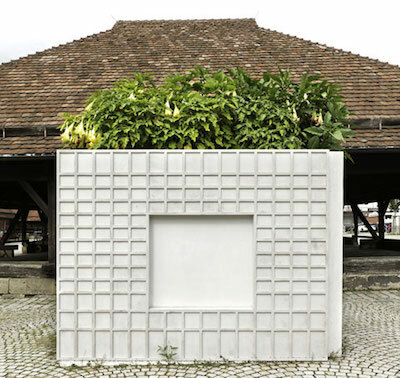 It will be the next in this major series of annual site-specific commissions by renowned international artists. The Danish art collective SUPERFLEX will unveil today (17 February) a new installation called Hospital Equipment, which consists of functioning surgical equipment that will be shipped to a Syrian hospital once the exhibition is over. The collective describe the work as "a ready-made upside down, since we not only take a ready-made object into an art context, but we bring it back into the world again". The surgeon's table, surgical tools and mobile lamp that form the work at the Von Bartha gallery in S-chanf, Switzerland, will be packed-up and transported to the Salamieh Hospital in Hawarti, a village in the southwestern Hama region, following the dismantling of the show on 18 March. All that will be left of the work will be three "slightly different and unique" photographs, a gallery spokeswoman says, while the rest of the piece carries out its practical functions in the hospital. But, "as much as it is an operation table in the gallery, it is an artwork inside the hospital," the artists say.